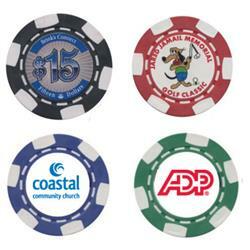 Custom poker chips with your logo directly printed on the chip! No lame paper tags and a nice heavy 0.4 ounces for each chip! Available with black, blue, green or red outer accents. 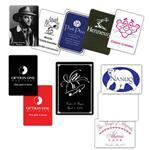 A great fun promotional item great for school fun nights, poker night or as a trade show prize token! 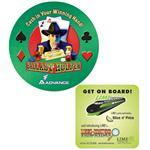 These promotional poker chips will be a keeper whether used as a corporate gift or for casino night. FREE RUSH PROMOTIONAL ITEM - INQUIRE! Available Colors: White with black, blue, green or red accents. Need full color printing? Add $.35 each. 1 1/2 inch direct print heavyweight poker chips. Bulk packed, 200 pieces to a cello bag.